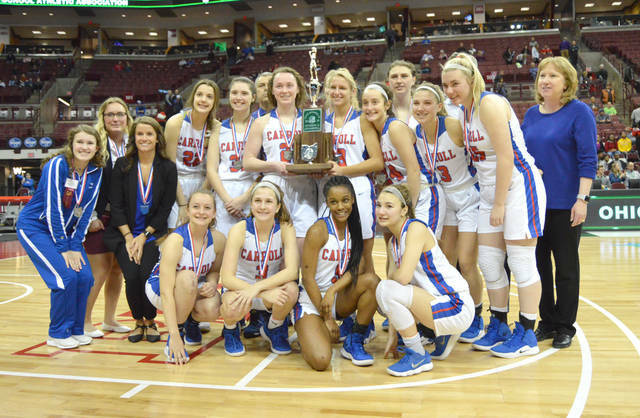 The 2018-‘19 Carroll High School girls basketball team poses with the Division II state runner-up trophy, March 16 at the Jerome Schottenstein Center, on the Ohio State University campus in Columbus. Carroll’s Ava Lickliter (11) prepares to take a charge from Toledo Rogers’ Madison Royal-Davis, in the first half of Saturday’s Division II girls high school basketball state championship game in Columbus. 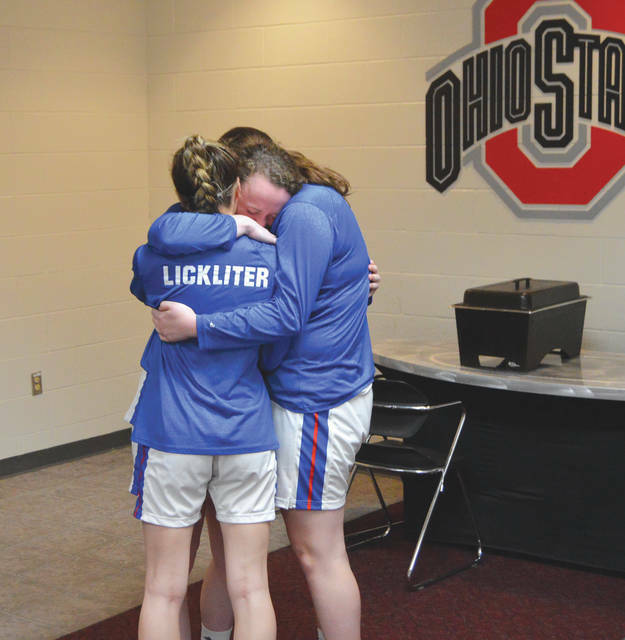 Carroll teammates Ava Lickliter, Julia Keller and Elisabeth Bush embrace moments after the team’s post-game press conference, March 16 at the Jerome Schottenstein Center in Columbus. 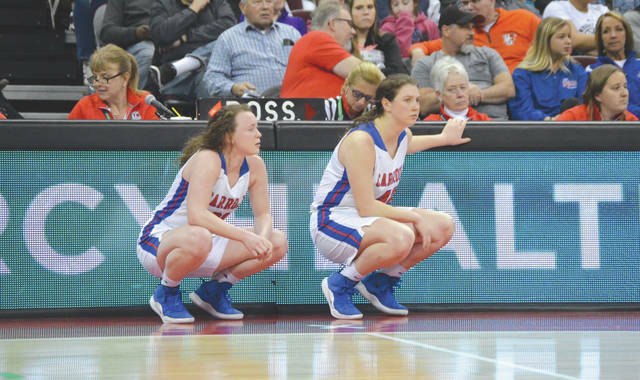 Teammates Elisabeth Bush (left) and Julia Keller wait to go into the game, during the Division II girls high school basketball championship game against Toledo Rogers, March 16 in Columbus. Keller tied for scoring honors with 17 points; Bush finished with 14 points and 12 rebounds. COLUMBUS — Every team goes through that game where the shots just don’t seem to fall. The basket seems like it’s another five feet higher in the air, and the rim’s circumference is that of a doughnut. 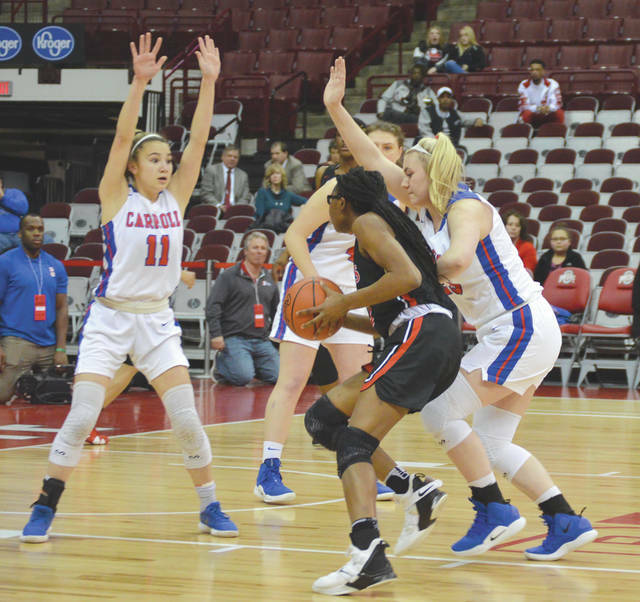 Carroll High School’s girls basketball team dealt with a case of tough shooting on the state championship stage, and two-time state champion Toledo Rogers had a lot to do with it. While Carroll took more shots (51 shots, to 45 for Toledo Rogers), Rogers’ defenders would swoop in to snare the misses. The Patriots rarely got a second chance. Rogers never trailed in a 56-45 win, to claim their second consecutive Division II title. Throughout the season, Carroll (27-3) had scored 45 or fewer points six times: an early-season road win over Cincinnati McNicholas, a home-and-home series of wins over Greater Catholic League Co-Ed North divisional foe Kettering Alter, losses to Division-I Beavercreek and eventual Division IV state champ Minster, and now Toledo Rogers. In Saturday’s final under the bright lights of Ohio State’s Jerome Schottenstein Center, Carroll hit just 16 of 51 shots. Forty eight hours after shooting 41 percent from behind the 3-point line in a state semifinal win over Akron St. Vincent-St. Mary, the Patriots could convert only 3-of-12 3-pointers in the title game. Coach Cecelia Grosselin remained very proud of how the girls battled, and said the team will have a lasting memory posted in the Carroll High School gym. “We have a banner up in the gym and it says Final Four. There’s only one other year on it, and that’s 2011. That’s the year we had Kelly Austria,” Grosselin said. “I said ‘You’re gonna have another number up there now: 2019. So any time you walk into that gym and you see that number, you should be proud of that.’ I’m very proud of this team and of how far they came. Grosselin said she’ll miss seniors Elisabeth Bush, Meredith Schrock, Eve Thorner and Rachael Hartong. Bush and Toledo Rogers’ junior Zia Cooke — the Ohio Division II Player of the Year — both turned in double-double performances on the state’s biggest stage. Bush finished with 14 points and 12 rebounds while Cooke scored 13 points and hauled down 11 rebounds. Both earned All-Ohio recognition this season. Carroll’s Julia Keller tied Rogers’ Madison Royal-Davis for high scoring honors with 17 points. Ava Lickliter (six points), Allie Stefanek (five) and Sarah Ochs (three) also scored for Carroll. As the post-game press conference ended, players Bush, Keller and Lickliter posed for a photographer, and then embraced in a group hug. Tears flowed as the emotions of the season finally caught up with them. It’s a girls high school basketball season that none of them will likely ever forget.